I can't believe that I haven't written to you since June, when Ian graduated from P.S. 41. He's already been at Lab Middle School for nearly a month and even though it's going to be close to 80 degrees tomorrow in New York City, today is October 1. Breast cancer awareness month is upon us, the world suddenly is awash in pink, and with the color adorning everything from yogurt lids to coffee cups, tee-shirts, and football helmets comes an emotional roller coaster of memory, and yes, many "what ifs," a few of which nagged at me last night. Barbara Walters moderated a BRCA awareness symposium at Central Synagogue that was geared specifically for the Jewish community, where the incidence of BRCA gene mutations is 10 times greater than in the general population. (Too much in-breeding in the shtetl, I always say.) The event was the outgrowth of a High Holiday awareness campaign during which posters with BRCA information were sent to every Reform and Conservative congregation in the country in the hopes that they'd be displayed in lobbies and restrooms where they could be seen and read by worshipers throughout the High Holiday season. In any event, there was a terrific turnout, and it looked as though most of the sanctuary was filled. A classical rendition of Hinei Ma Tov opened the program, sung by a woman with a lovely voice, accompanied by violin and piano. Peter Rubinstein, who's going to retire at the end of this year, I think, followed with a few remarks. Two congregants from Central, Mindy Gray, who with her husband provided funding to establish the Basser Center in memory of her sister, Faith Basser, who died of ovarian cancer at 44, and Stacey Sager, a WABC-NY reporter who had both breast and ovarian cancer and isn't yet 50, also spoke briefly after which the panel discussion began. Barbara Walters was a wonderful moderator, and there was even time at the end for two or three questions from the audience -- which we submitted on index cards. 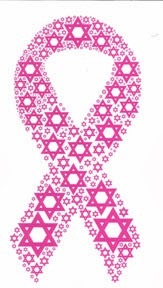 If you're Jewish and have relatives with breast and/or ovarian cancer, talk to your doctor about genetic counseling and testing. Don't be afraid to pursue genetic counseling and testing. In most cases, insurance will cover the cost for individuals of Ashkenazi Jewish descent. Knowledge is power and this power, as I know from my own experience with HBOC syndrome, saves lives. If you experience any of these symptoms for a period of a week or more, go see your doctor and ask him or her to prove that you don't have ovarian cancer: bloating, abdominal pain, a full feeling after eating, or urinary symptoms that include increased urgency or frequency. If you find yourself in need of medical professionals who are experts in the world of hereditary cancer syndrome, they're most often located at large medical facilities in urban settings. Go after them. So that's the latest from here, The Mums. It's late and I'm tired so I'm going to close for now, but I won't wait so long to write again. P.S. As a volunteer outreach coordinator for FORCE, which was one of several participating organizations last night, I did a good bit of work to publicize the symposium, mostly on social media. In doing so, I had a lot of email correspondence with Becca Mueller, a genetic counselor from the Basser Center, and it was great to meet her in person last night. What's more, she put me in touch with the blogger for the Abramson Cancer Center blog, and I was able to write this post for them, which went live today. Where in the World is JanetheWriter?